Vertigo can affect a person’s entire life, especially when chronic bouts occur on a near daily basis. Don’t accept the notion that vertigo is just a part of getting older or that there is nothing you can do about it. 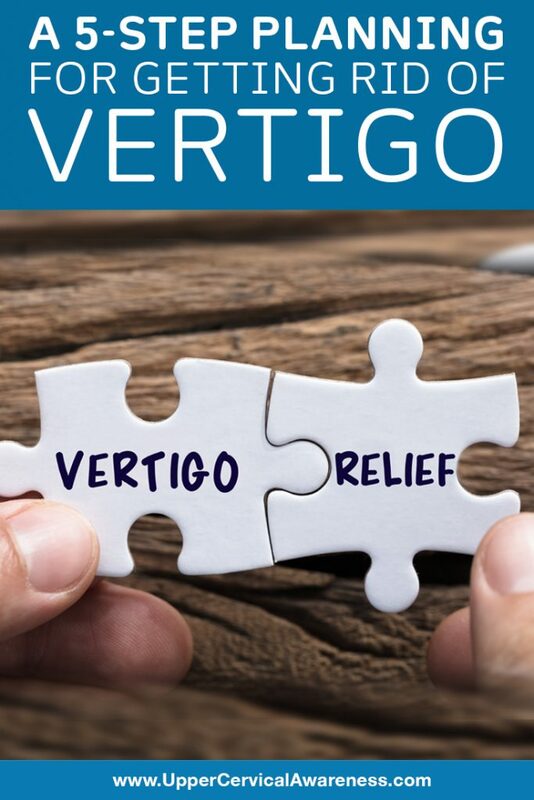 We have helped 100s of people to gain victory over vertigo. How? Vertigo ultimately stems from one of two sources. Peripheral vertigo diseases affect the ear and throw off balance and spatial orientation in this way. Central vertigo conditions affect the central nervous system, causing signals that are sent from the ear to be misinterpreted by the brain. Either way, the result can be a spinning, swaying, or tilting sensation. How are both types of vertigo related to the upper cervical spine? Peripheral Vertigo – The top bone in the neck, the atlas, is located at the base of the skull. This puts it right in between the ears. One theory on how the atlas affects the ears is that it can restrict the Eustachian tubes from properly draining away excess fluid from the ears. This, in turn, can lead to severe vertigo and even Meniere’s disease, a rare vestibular condition. Central Vertigo – The atlas surrounds the brainstem. Even a slight misalignment can affect brainstem function. Also, the cervical spine facilitates blood flow to the brain, so misalignments can keep the brain from getting all of the oxygen it needs. Clearly, for optimally central nervous system function, a properly aligned atlas is necessary. We’ve put together a 5-step plan to help our readers get rid of vertigo the safe and natural way, by seeking upper cervical chiropractic care. You’re well on your way because you’ve already reached this step. So many patient testimonials start with the patient saying that he or she had never heard of this subspecialty in the chiropractic field. Hopefully, this article along with others on the Upper Cervical Awareness blog will help you to learn about this effective means of helping vertigo and many other conditions, providing long-term results. This is often as simple as making a phone call or submitting an online contact form. The tricky part is finding a practitioner near you since the number of chiropractors who use upper cervical techniques are a small fraction of the field. One way to locate a practitioner in your area is to use the search feature on this site. It will help you to locate one of our preferred upper cervical chiropractors in your area. Most practitioners offer a free (or low-cost) consultation. This will help you to determine if upper cervical chiropractic is a good option for you. There is no obligation. If you don’t like what you hear on the initial call or the first visit, you are free to walk away and give something else a try. What we find is that most people who get to speak with a practitioner about upper cervical chiropractic realize the potential benefits when it comes to vertigo and many other health problems. This helps to build anticipation for the results. Now we start getting to the root of things. Not in all cases, but frequently, a patient history helps to identify a possible cause of an upper cervical misalignment. Perhaps you were in a car accident or suffered a sports injury. Horseback riding injuries are also common. However, even a slip and fall can lead to an upper cervical misalignment. Then there are wear and tear causes such as an office job where the desk is not set up in an ergonomic way or someone who does a lot of driving. Unfortunately, we do sometimes run into cases where the injury was caused by things like an assault or domestic abuse. After the patient history is completed, it is time for some diagnostic imaging. X-rays and thermographic imaging are popular among upper cervical chiropractors. Modern imaging techniques are important for two reasons. First, they ensure that there is no structural damage to the neck that would make it unsafe to provide an adjustment (adjustments are gentle and inherently safe, so this would be rare). Second, we use the imaging to precisely measure the degree of misalignment. This allows us to customize each patient’s adjustment for maximum results. Finally, you will get a physical examination before your adjustments and at the start of each visit. This involves checking things like leg length and whether the hips and shoulders are even. We’re not going to take x-rays every visit, but we also don’t want to adjust your atlas if it has stayed in place since your last correction, so the physical examination is an important part of the process. The first adjustment sets you on the road to recovery but depending on how far off the alignment is and how long the vertebrae have been out of place, you may need to return for your next examination and possible adjustment within a few days to a week. The longer your adjustments hold, the further you can spread out your exam appointments. That also makes upper cervical chiropractic a cost-effective form of care. Vertigo may be a very common ailment, but that doesn’t mean you personally have to live with it. Find an upper cervical chiropractor near you to see if this is the right solution for your vertigo problems.